FREE $10 Omaha Steaks Gift Card! UPDATE: Omaha Gift Cards are gone, but you can request an invite to get more free gifts at a later time. It’s no secret, we love our fans. 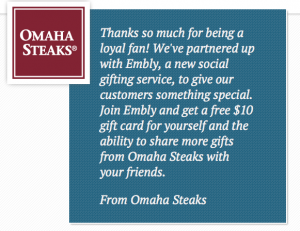 We’ve partnered up with Embly, a new social gifting service, to treat steak fans to a $10 Omaha Steaks gift card! There is a limited supply of gift cards available, so get them while they’re hot! NOTE: The page is running very slowly right now, so you'll need to be patient or try again later.